Was Steve Rogers legally a “Captain” America? Col. Chester Phillips: I asked for an army and all I got was you. You are not enough. Senator Brandt: [to Steve] With all due respect to the Colonel, I think we may be missing the point. I’ve seen you in action, Steve. More importantly, the country’s seen it. [to his aide] Paper. [the aide shows them the news paper (‘The New York Examiner’ Vol. XCVII No. 33.634, Wednesday, June 23, 1943), headlines: "Nazis in New York - mystery man saves child"] The enlistment lines have been around the block since your picture hit the newsstands. You don’t take a soldier, a symbol like that, and hide him in a lab. Son, do you want to serve your country on the most important battlefield of the war? Steve Rogers: Sir, that’s all I want. Senator Brandt: Then, congratulations. You just got promoted. Well obviously, "Captain America" sounds better than "Private America" but was this promotion legal? A battlefield promotion is awarded to enlisted soldiers who are promoted to a higher enlisted rank during combat or combat conditions. [...]"Battlefield promotions are predicated on extraordinary performance of duties while serving in combat or under combat conditions." It can be used to promote an individual soldier one grade, to at most staff sergeant, and has a variety of constraints. A battlefield commission is awarded to enlisted soldiers who are promoted to the rank of commissioned officer for outstanding leadership on the field of battle. The granting of a battlefield commission has its historical predecessor in the medieval practice of the knighting or ennoblement of a plebeian combatant on the battleground for demonstration of heroic qualities in an exceptional degree. In the medieval context, this martial achievement was often one of the main restricted pathways into the sword-bearing feudal aristocracy. From World War I to the Vietnam War, over 31,200 sailors, soldiers, Marines, and airmen had been awarded battlefield commissions. Such a commission is usually advancement from a position of non-commissioned officer to a commissioned officer, generally O-1 - Second Lieutenant, or Ensign in the Navy and Coast Guard. So we have here a guy, who jumped not only 7 grades as a NCO but also 3 grades (from 2nd Lieutenant to Captain) without any officer training. Was this promotion legally binding or was Steve only "honorary Captain"? In the movies it appears that he is actually a Captain. 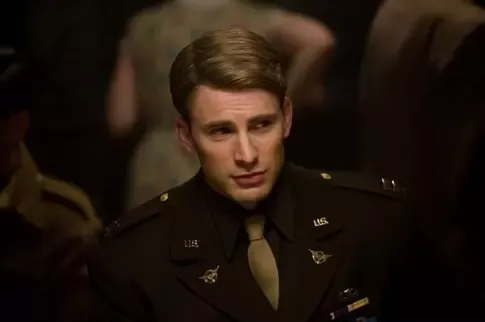 In the film Captain America: The First Avenger, Steve Rogers enlists into the Army as a private (rank E-1). Upon his successful transition via the Super Soldier serum and a training period of some length, he is promoted to the literal rank of Captain (O-3), as shown by his service uniform rank insignia. So it seems that the film-makers adopted the fact that he was a legitimate captain. But in the comics we cant be sure. Beginning in World War II, the "secret identity" of Captain America was in fact his real name and enlisted rank, i.e. - Private Steve Rogers, who deliberately acted the part of a soldier so inept they couldn't even risk sending him to battle, so he remained stationed at an Army base in Virginia as a cover for his operations as Captain America. This is where the question of Cap's "real" rank becomes tricky because of the complicated continuity. Depending on who was writing it, either Captain America was really just an Army private, or he was in fact a commissioned captain who was merely posing as an Army private as part of his cover story. To make things even more complicated, when he is operating in the battlefield as Captain America per se, his designation as "Captain" becomes a far more grandiose title than mere rank might suggest. Owing to the advanced tactical and strategic training he has been given, in addition to his security clearance levels and combat experience, any time "Captain" America engages with the U.S. military, he does so with full operational authority over all forces. For all intents and purposes, he outranks any other military officer in the room, even if that officer is a full four-star general or admiral. Yet despite this insane level of authority, I believe that even in the present he still formally draws pay from the U.S. military as if he was just plain old O-3 Captain Rogers. So, according to the comics he may be either a Private or a Captain, we can't be sure. Update: according to this source he is a captain but i doubt the credibility of this. Not the answer you're looking for? Browse other questions tagged marvel-cinematic-universe captain-america-the-first-avenger . How did the Tesseract end up in Norway during the events of Captain America? Does Captain America possess superhuman strength in the MCU? How did they make Captain America so tiny and skinny in the first half? Why do we say that Captain America is the first avenger? Is Captain America captain of the Avengers team? What lead to the fights between Iron Man and Captain America in Captain America: Civil War? Was Steve Rogers supporting Bucky by lying? Why is Captain America unbeatable?